It is no secret that we love jerky and we want to know all about tasty, dried meats. In the history of beef jerky, we are pleased to report that there is plenty of evidence that people around the world have been enjoying this tasty, healthy and highly portable choice for a long, long time. 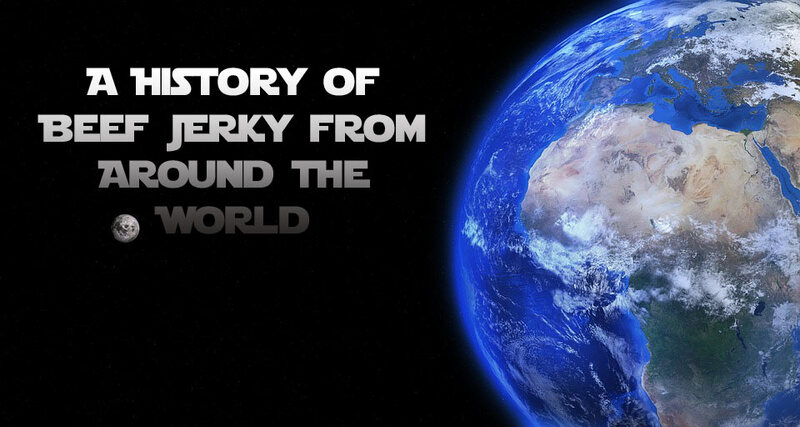 Reaching across the far corners of the globe and into the dark corners of history, we present a history of beef jerky. Jerky has long been a popular way to preserve and enjoy nutrient dense food. Jerky is easily portable and has been a staple for many populations. Almost any meat can be made into jerky. The oldest evidence of jerky has been found in Egypt. Thousands of years ago Ancient Egyptians were drying mass amounts of meat perhaps by laying strips of meat out in the sun. Archeologists made this discovery when they found dried foods preserved in tombs. Meat in jerky form is not subject to decay or insect infestation and could have been stored for long periods of time–especially in a tomb. The word “jerky” comes from the Quechua language native to South America. The Incan empire had been making “Ch’arki” since about 1550. “Ch’arki” which means “dried meat” was a product from the Andes Mountain range. Ch’arki was made from all kinds of pounded, deboned meat, but was probably most common from Alpaca and Llama which are native to the region and became domesticated about that time. Ch’arki was shared with the Spanish conquistadors in the area. Explorers were impressed with ch’arki and eventually brought it back to Western Europe. Native Americans made a jerky variation called “Pemmican”. Dried meat, fats and berries went into pemmican and it was highly sought-after. Pemmican’s longevity and portability made it a favorite of explorers, pioneers and early settlers. Pemmican is a Cree word that comes from fat/grease and this jerky-like food became a trading staple of many Native American tribes. Pemmican was made out of whatever meat was available which was usually Bison, Deer, Elk or Moose. Early pemmican makers used cranberries and Saskatoon berries, other berries like blueberries and cherries were used only in ceremonial or wedding pemmican. The process of making pemmican differs from other jerky types. Meat was cut into thin slices then dried either in the hot sun or a slow burning fire until it was hard and brittle. Then the hard meat pieces were pounded with rocks until it became very small pieces or pulverized into a powder. Then the pounded meat was mixed with melted fat. Dried fruits were added, after also being pounded by stones. The result was a calorie dense mixture, high in fat. There were three noted ways to eat pemmican. The first, and the simplest, was that it could be consumed as-is. Second, pemmican was made into a stew as it was mixed into water, flour and wild onions and potatoes; called “rubaboo”. The third way, seen by hunters on the Great Plains was a fried pemmican cooked alone or with potatoes and onions. This was called “rechaud”. “Coppiette” is an Italian version of jerky. It is a dried meat stick that was once made of Horse or Donkey and consumed by poor farmers. Meat of the hind legs was cut into strips and slowly smoked, therefore tenderizing the meat. It was a means of using all the animal, not letting anything go to waste. Sheep and Goat were also used. Coppiette comes from Castelli Romani, or Roman Castles, which is an area of small towns South East of Rome, Italy. Meat was seasoned with salt, fennel and red pepper flakes making this a tasty (if a little odd looking) dried meat stick. Meat was tied in twos which is where “copiette” gets its name “little couples” and dried in front of a hearth or fireplace for 60 days. For this reason, it was usually made in the winter months. Coppiette was a popular dinner in local taverns and was served with crusty bread. As it is salty it made diners thirsty and they tended to order more wine. It is currently made from Pork, yet more traditional varieties can be found in small towns outside of Rome. Ethiopians have a history of making their own variety of jerky called “Quant’a”. Meat strips are seasoned with salt, black pepper and berbere or awaze. Berbere is a spice mix which includes chili peppers, garlic, ginger, basil, and fenugreek. It’s a popular spice mix in the cuisines of Ethiopia and Eritrea. Another form of jerky found in West Africa called “Kilishi”. It is considered a delicacy in Hausa Land, a region of Nigeria and Niger with some populations in Cameroon, Côte d’Ivoire, Chad, Togo, Ghana, Sudan, Gabon and Senegal. Kilishi is often a beef jerky made from Cow, but can also use Sheep or Goat. Each limb is deboned and each muscle is then sliced into thin, sheet-like sizes. The sheets of meat are allowed to dry in the sun, then submerged into a sauce of peanuts, water, ground onions and spices. It is then left to dry then roasted on a wire mesh. Preserved kilishi can be kept for months. The history of beef jerky also has roots in South Africa. “Biltong” is a Dutch mash up of “bil” meaning rump and “tong” meaning tongue or strip. Native South Africans such as the Khoikhoi had a process of preserving meat by slicing it into strips, curing it with salt and hanging it up to dry. The large game population of the region made meat preservation essential. European explorers tried to build up livestock herds but that took years. They needed preserved meat sooner and coined the term biltong. History points to the Voortrekkers, a group of Dutch pioneers, for spreading the popularity of biltong to the north in the 1800s. Biltong was made by hanging meat outside for a period of about two weeks, otherwise known as a fortnight. People made biltong during the cold winter months, which helped inhibit spoiling. Traditionally, biltong was marinated in a vinegar solution for a few hours, then the liquid was poured off and the meat seasoned with salt and spices. Spice mixes consisted of rock salt, roasted coriander, black pepper and brown sugar. Vinegar is a great inhibitor of bacteria while the spices all have antimicrobial properties. Modern day biltong is usually made with Beef. It is a common snack in South Africa and can be found in butcher shops and grocery stores. A major difference from jerky is that biltong is never smoked. Biltong may be eaten by itself or can be chopped up and added to stews, muffins and bread. Some people like to use is as a teething aid for babies. The varied history of beef jerky shows that a vast number of people have been enjoying jerky throughout the ages. From the grass lands of Africa to the high plains of the US, the popularity of jerky simply cannot be argued. And lucky for you, you don’t have to travel back in time or slice your meet as thin as sheets and dry it on a rock. Mountain America Jerky has you covered! Yes! Great thought, Carol. China’s historical form of jerky is called Bakkwa, and it is a salty dried meat product typically made with pork. It is thought to have derived from an Ancient Chinese technique for preserving meat and is considered a delicacy. With Bakkwa, meat is sliced thin, marinated and air dried before it is cooked over a hot plate. Have you tried it? Thanks for your input!